You are here: HomenextPlacesnextSchoolsnextDowns SchoolnextMiss Hake's class c1963. Unfortunately, I can only remember a few of the names of pupils. 2nd row: ? ?, ??, ? ?, me – Larry Roy, ??, ? ?, ??, ? ?, ?? 3rd row: ? ?, ??, ? ?, ??, ? ?, Sandra Fields, ??, ? ?, ?? 4th row: ? ?, ??, ? ?, ?? I do hope that people with better memories will be able to recognise more pupils. If you do recognise yourself or anyone else, please post a comment below. Pretty sure 2nd from left on front row is Raymond French,and far right on row 2 are Michael Townsend and Robert Mitchell. 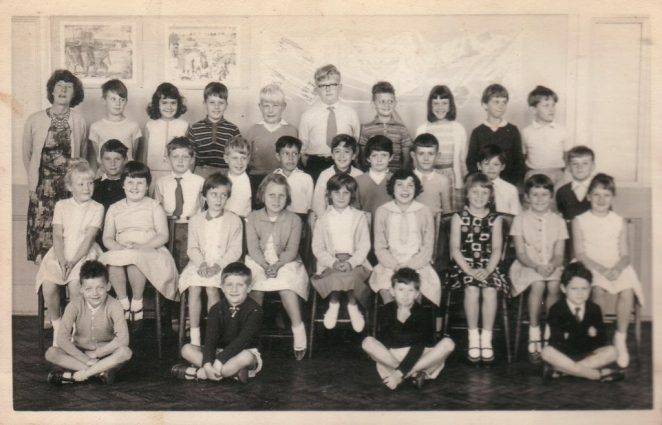 Miss Hake's Class 9, 1967. Mr Hall's class 11 1968.